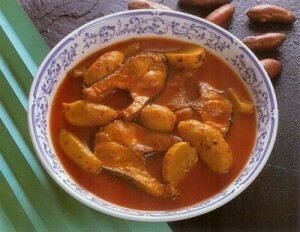 Fish In Masala recipe by Nazia Nazar at DesiRecipes.com. Grind all the spices together except onion and methi . Fry the onion in oil. Add the grinded spices and methi and dry the water. Add the pieces of fish and leave on very low heat. Oh my 34 green chiles!